In the East Texas of the late 1980s, two rough and tumble ne'er-do-wells with hearts of gold try and fail to stay out of trouble. 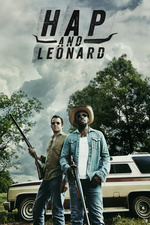 After mixing it up with anarchists and thrill killers last season, Hap and Leonard would like to take it easy. But as if contending with a group of obnoxious drug dealers weren't bad enough, our heroes find themselves at the center of a murder investigation when Leonard finds a body buried in the basement of his late uncle's house. My dvr didn't record this so I had to hunt down the first three episodes.